One of my new years resolutions is to share more of my old photos with folks – so here’s the first assortment from my “Random Roadside” box of photos! 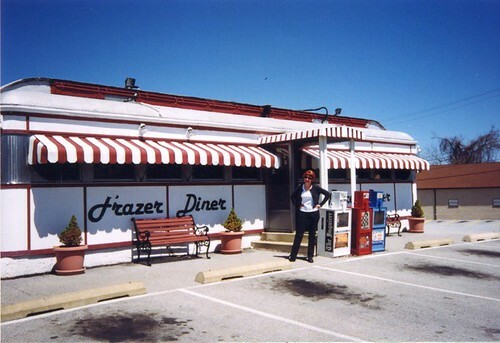 Here’s me in front of the Frazer Diner in the spring of 1999. As I mentioned on my writeup of the Frazer Diner I had no idea when I was posing for this photo that I’d end up living 15 minutes away from it, with a cute guitar player. I’m sure glad it worked out this way! 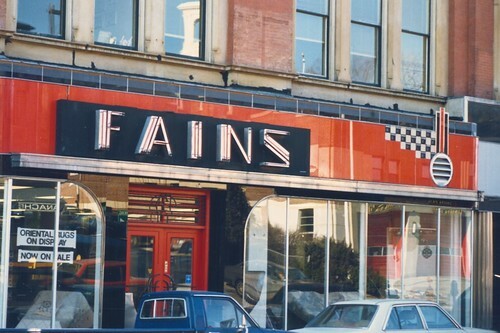 This is a photo of Fains Carpet Store in Providence RI taken some time between 1987-89. 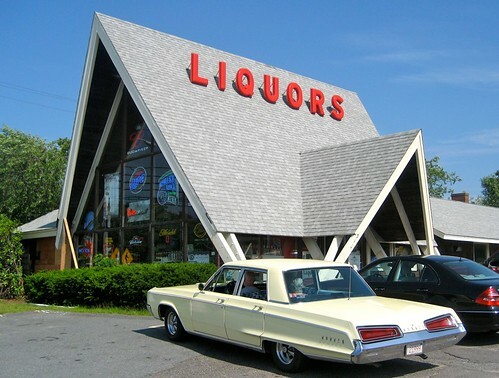 Roadwarrior Debra Jane Seltzer posted some photos of this striking storefront in her Roadside Architecture blog recently, and I knew I had a photo when it was still Fains. Love the Art Deco facade! I’m pretty sure that this photo was taken on the same trip to Rhode Island as the Fains facade, not sure why I didn’t shoot the diner itself, but I think we got off at the wrong exit and were turning the car around. 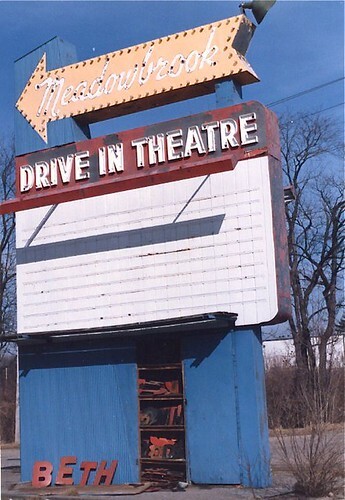 In the small world vein I see that roadpal Gunnar shared some photos of the Meadowbrook Drive In Theatre in Middleboro MA on his blog Eccentric Roadside. The comments indicate the theatre closed in 1987 so I must’ve shot this shortly therafter. 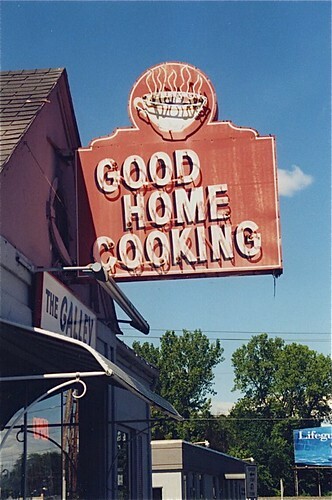 I know there are small reproduction metal signs of this classic Good Home Cooking sign floating out there on the internets, but this photo is of the real deal, from The Galley Restaurant in West Springfield MA. Taken in 1995 by moi! 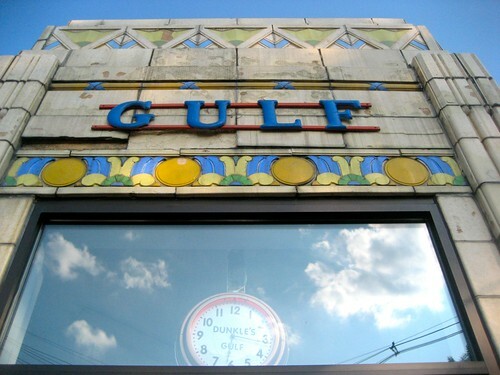 Here’s a link to some of the history of the Galley’s sign if you’re interested. 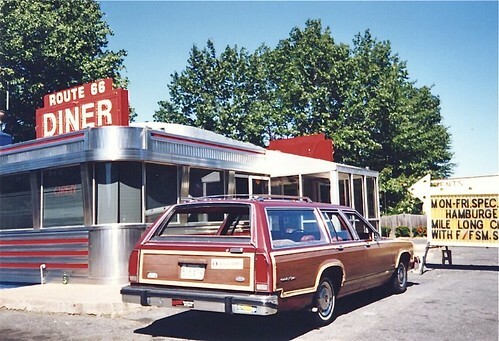 This photo of the Route 66 Diner was taken in 1995 in Springfield MA as well. I remember eating here and the diner being clean as a whistle, and very affordable. 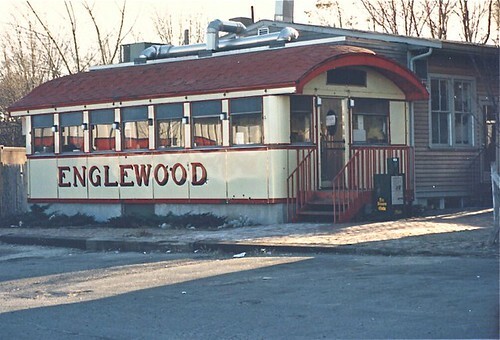 The Englewood diner used to sit behind the Capitol Market in Dorchester MA and I’d see it every day going to and from school. That whole shopping complex was very cool with a big neon sign for the market as well as the restaurant next to it, I think it had a Bradlees too. Not sure why I didn’t take more photos of the entire place, but if I beat myself up for all the photos I haven’t taken I’d be a black and blue pulp. So I DID take a photo of this classic diner, before it got moved. That is just a drop in the bucket of the Retro Roadmap Photo Archives, dear readers. I’ll be sharing more of them as inspiration hits! I don’t know what the weather has been like where you are today, but we have rain over snow here in PA, my car stalled out on the way home from work, and we’ve got another lousy snow storm headed our way. With all that I thought it was the right time to share with everyone some absolutely fabulous vintage vacation photos from the collection of Aladdin Color that are are available for all of us to drool over at RetroStockPix.com. I chatted with Eric Bard- the man behind Retro Stock Pix and whose father began Aladdin Color in 1957. He was kind enough to answer a few questions for me, so I could share the info and the wonderful photos available to purchase on his site. 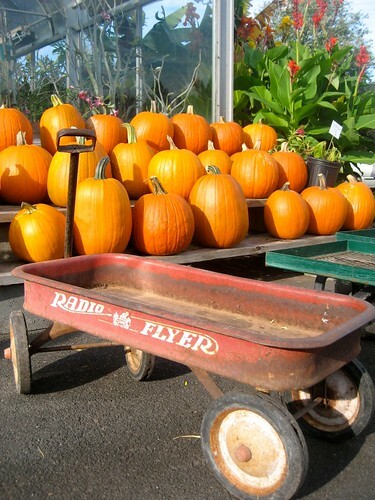 click here to read more and see some fab vintage photos! I came across a few slides that I thought might be of interest to to Retro Roadmap Readers, and I was wondering if any of you might know where they were taken? I can ask dad next time I see him but I don’t think he’ll know them by my description over the phone. These were taken some time in the late 50’s early 60’s- pre 1963, the year my folks were married. 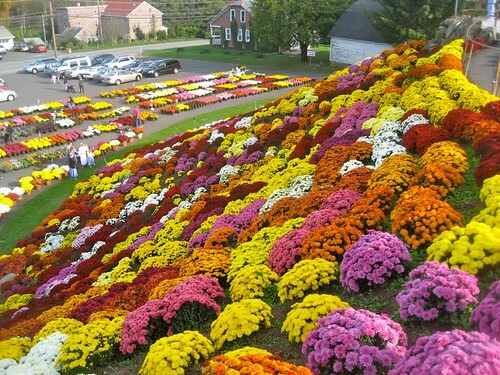 Probably in the MA, NH, RI area from the looks of the surrounding photos. Any ideas, sleuths? OK all you Joe Hardys and Nancy Drews, let’s see if we can find out something about these! 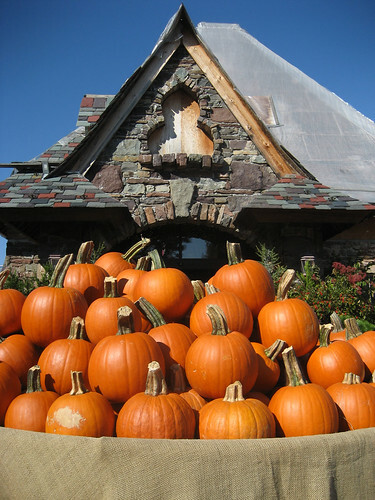 I’m heading down to Rehoboth Beach DE for the weekend and have a number of old “haunts” to visit for Retro Roadmap— just in time for Halloween! 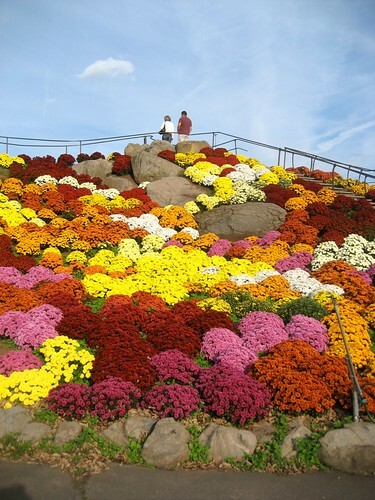 Here are some photos of one of my fave fall places to go to – Ott’s Exotic Plants in Schwenksville PA. I’ll be writing more about it this weekend, but thought that the bright fall colors would be a good antidote to the grey, rain and – gasp- SNOW some dear readers are experiencing this week! I’m still playing catch up with some of the great places I’ve visited this summer that will be featured on Retro Roadmap in the upcoming days. Get a sneak peek by checking out the Retro Roadmap photo group on Flickr. Anyone can join and add their Retro Roadmap-worthy photos to the group! A rainy day in Mass means a morning spent going through and uploading just some of the zillions of photos I’ve taken on this trip. Can’t believe I’ve visited so many great places, and in turn have so many more I want to visit! check out the Retro Roadmap Flickr Group to get a sneak peek of the upcoming content! This week’s Flickr Friday gives us a feast for the eyes, the wonderful group of photos collected in Old “Real” Diners! 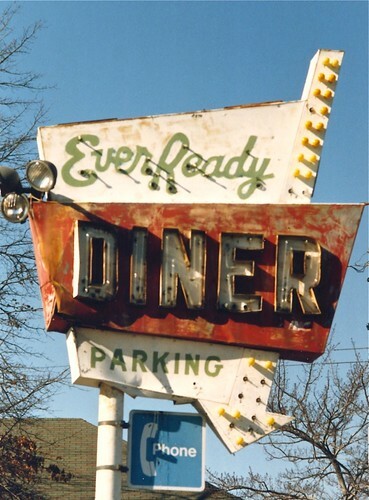 This group is for photos of old diners (not the super chrome modern ones). The photos can be exterior shots, details, and interiors as long as they feature predominantly the design (not the food or people inside). Trolley cars & street cars that have been converted into diners are okay, too — but not regular coffee shops or restaurants (that may just call themselves “diners”). The structures themselves should be the prefabricated & installed type. Here are a few from my archives, but take a look at the set that our Roadtrip Resource Debra Jane Seltzer of Roadside Architecture has helped to collect online! If you see a photo you like, give some love, people always need positive feedback.